Very slightly more green than blue, “Tropical Rain Forest” can be thought of as a dark cyan. My wife called me the other day and asked what my favorite color was. She explained that she just needed a color in the most general terms, because she was buying me a case for my new iPhone. So I said “blue.” But I was disappointed that I didn’t get to be more specific. 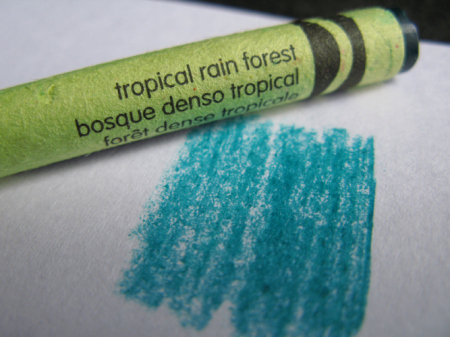 You see, my actual favorite color is (currently) Tropical Rain Forest, formulated by Crayola in 1993. Its RGB color code is (0, 117, 94). If you want to read about the color, it’s the first variation on jungle green in the Wikipedia article of the same name. But what’s an RGB color code? Anyone familiar with computer graphics will recognize RGB as standing for Red/Green/Blue, which are taken to be the three primaries. And therein lies a tale: for didn’t we all learn in kindergarten that red, blue, and yellow (not green) were the primary colors? What’s going on? Light comes in different wavelengths, or more commonly, combinations of multiple wavelengths. Color is a purely biological phenomenon having to do with what we perceive with our eyes. So when a kindergarten teacher says that “mixing red and blue make purple”, there’s really a whole lot of physics and biology that’s being glossed over. 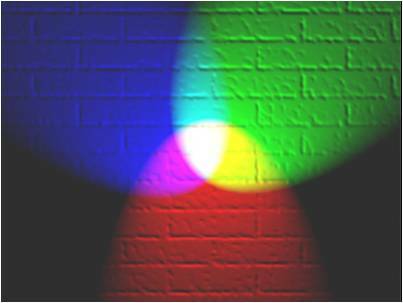 In our retinas, we (generally) have three kinds of cones that react to incoming light. These cones can detect many wavelengths of light, but each peaks in a different part of the spectrum. Very simplistically, we can say that one peaks in the “red” part of the visible spectrum, one peaks in the “green” part of the spectrum, and one peaks in the “blue”. Looking at this chart makes the notion of an “additive” primary easy to understand. We declare red, green, and blue (RGB) to be the additive primary colors. We can then build (most) other colors by adding these colors together. This corresponds to multiple wavelengths of light stimulating one or more cones in the retina to varying degrees. If you want an applet to play around with this kind of additive color mixing, try this. Input (0, 117, 94) if you want to see Tropical Rain Forest. Now, tell a 6-year-old that Red + Green = Yellow, and they will look at you like you’ve grown a second head. That’s because most experience we have with “color mixing” doesn’t involve mixing different kinds of light; it involves mixing different kinds of pigments. And that’s a totally different ball of (crayon?) wax. Suppose I have a flashlight that shines red light. I have another flashlight that shines green light. If I shine both flashlights into your eyes, you will see yellow, as we just discussed. With two flashlights (two colors), more light has reached your eyes than would have with just one flashlight. Pigments (such as crayons or paint) work in the opposite way. “Red” paint is paint that takes white light (a combination of R,G, and B) and subtracts some of the light away, so that only the R reaches your eyes. Green paint takes RGB light and lets only the G reach your eyes. In other words, red paint “blocks” G and B, whereas green paint “blocks” R and B. Can you guess what happens if we mix red and green paint? The 6-year-old knows you get black. That’s because two successive blockers have filtered out all the light, and nothing reaches your eyes at all. And when no cones are stimulated, we perceive that as black. When a teacher says that the “primary” colors are red, blue, and yellow, they are referring to so-called subtractive primaries. By mixing those three kinds of pigments, you can make many of the colors we can see. But not all the colors. Try mixing red, blue, and yellow to make pink. It cannot be done. Like the additive primaries, the gamut of the subtractive primaries is limited. And, like the choice of RGB as additive primaries, the choice of red, blue, and yellow as the subtractive primaries is arbitrary. Arbitrary, and inferior. It turns out that using yellow, magenta, and cyan as the subtractive primaries expands the gamut and increases the number of colors you can make by subtraction. Why yellow, magenta, and cyan? Well, those choices make sense if you’ve already picked RGB as your additive primaries. Consider the chart above. It’s clear that a paint that looks magenta must be blocking green, since you’re seeing an (additive) combination of red and blue. Similarly, yellow paint blocks blue, and cyan paint blocks red. So what happens if we mix, say, yellow and cyan? Well, the mixture will block blue, and then block red, so what is left is green. You can try this here. Anyway, I spent some time at this site trying to determine exactly my favorite color. I finally chose Tropical Rain Forest, RGB=(0, 117, 94). I think it’s peaceful and organic. I also enjoy Tyrian purple, RGB = (102, 2, 60). Let me know which colors you favor. Coming soon: some thoughts about the extra-spectral colors!